Last time, I showed a few trajectories of cricket balls (or baseballs) thrown in the presence of wind-resistance. I noted that I had chosen the angle of the throw in order to maximise the range of the throw. This optimal angle changes as the throw speed changes, as shown below. 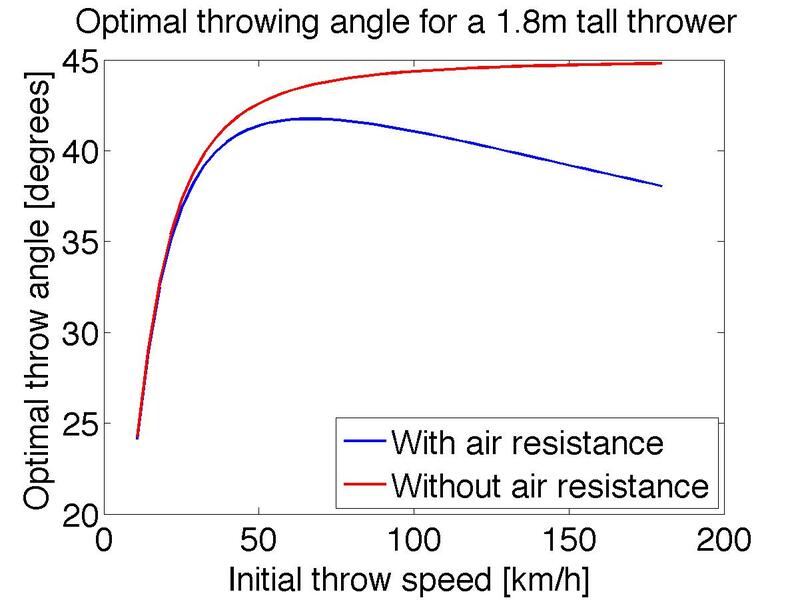 The first thing to note in that the optimal throwing angle in the absence of wind-resistance is not 45 degrees, because the ball is released from 1.8m above the ground. (It would be 45 degrees if thrown from ground level). The angle is significantly less than 45 degrees at low speeds – maximum range requires a balance between vertical velocity (giving you more air-time) and horizontal velocity (giving you more range). The height of the thrower gives the ball extra air-time for free, so the thrower should use a flatter launch angle when throwing speed is small. In the presence of wind-resistance, the optimal throwing angle drops below 45 degrees for very fast throws. The second, descending part of the balls trajectory will be slower and steeper than it would be in the absence of wind-resistance, so our thrower should opt for a flatter trajectory to take advantage of the higher velocity of the ball during its ascent. In short, about 40 degrees should do it. Next time – will making the cricket ball heavier help? This is fun. If height above the ground leads to a lowering of the angle to give maximum range, is there a height at which the optimum angle become negative?? No. It asymptotes to zero. If you set the angle below horizontal, you reduce the horizontal velocity *and* reduce the air-time relative to a horizontal throw. The faster the throw, the more significant the drag force. So for very fast throwers, throwing in air would be like throwing into treacle.